For older 2’s and 3-year-olds. Student-to-educator ratio is typically 7:1. 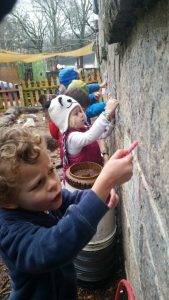 Turning Sun’s Preschool Level 2 Class builds upon the environment and curriculum from TSS’s Preschool 1 class. The children are greeted daily with beautiful and engaging invitations for exploration and play. Children have the choice to play with and explore many different materials and can work in small groups or independently. Small groups are formed to explore the theories of the children and the curriculum is emergent. Every morning, we have a morning meeting where children are invited to draw in their sketch books, sing songs, and discuss ideas. Turning Sun educators introduce a new material or skill, such as using a glue gun, using a camera, or making a play plan. Preschool Level 2 also makes their own classroom agreements to follow. 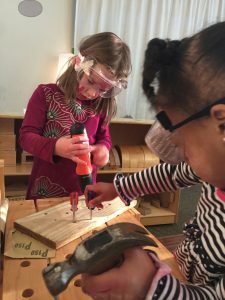 Like all Turning Sun classes, the Preschool Level 2 Class uses the project approach. Whether the children are reading a book about love and families, exploring their emotions through 2D and 3D self-portraits, exploring Atlanta Beltline artists, beading and using wire, or constructing paper airplanes, each day is a part of the journey in their individual class project. Increased focus is also given to hand strengthening, drawing, problem solving and developing theories. Experts are also brought in to further experiences and deepen the learning. The Preschool Level 2 Class also enjoys regular yoga classes, music classes, and garden time with TSS’s Environmental Educator. "Food comes from earth and helps our bodies."